Source: CICH graphic created using data adapted from the Public Health Agency of Canada. What Mothers Say: The Canadian Maternity Experiences Survey 2006-2007. Ottawa. 2009. http://www.phac-aspc.gc.ca/rhs-ssg/pdf/tab-eng.pdf -accessed July 24, 2017. 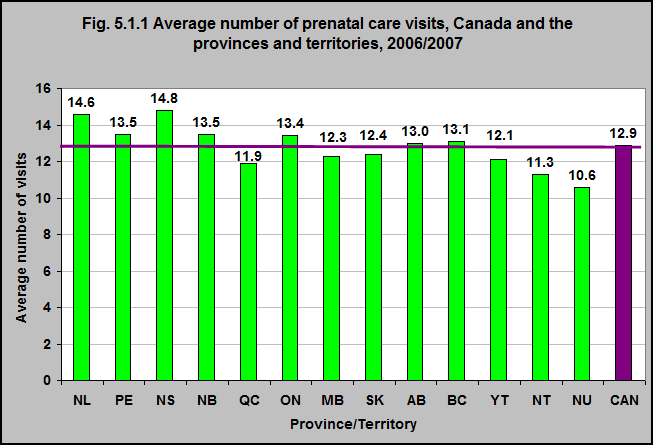 According to the Maternity Experiences Survey, the average number of prenatal care visits for pregnant women in Canada was 12.9 in 2006/07. The average ranged from 10.6 in Nunavut and 11.3 in the Northwest Territories to 14.6 in Newfoundland and Labrador and 14.8 in Nova Scotia. 1.1% of the women reported having had one to four visits, 31.7% had five to 10 visits, 50.5% had 11 to 15 visits, 12.9% had 16 to 20 visits, and 3.9% had 21 or more visits. That proportion was 1.1% in Canada, and varied from 7.7%* in Nunavut to 0.9%* in Quebec. Prenatal care is important for both the health of the mother and her baby. Prenatal care is considered to be most effective if women begin their care early – in the first trimester – and continue it at regular intervals throughout their pregnancy. The quality of care – that is what happens in each visit – is also important. If women have few prenatal visits, there may be risks associated with their pregnancy that are not identified. this could result in negative outcomes for both mothers and babies.